It’s hard to believe that four years have passed since Persona 4 dropped onto the PS2 in the US, but here we are and there it is. Atlus has been working on porting various other titles in the series to other consoles in-between creating original releases, bringing us the first two games in the series, Persona and Persona 2: Innocent Sin as well as a PSP remake of Persona 3, Persona 3 Portable, that offered a female protagonist as well as new events, but Persona 4 has been getting plenty of attention in its own right. With an animated series that’s slowly trickling into the US and an Atlus and Arc System Works developed fighting game in Persona 4 Arena, the game is becoming more of a focal point for Atlus this year, so it makes sense that we’d see a rerelease of the original sooner or later. Well, Atlus hasn’t disappointed, as they’ve brought Persona 4 Golden to the Playstation Vita, as an expanded release of the PS2 original. As I mentioned in my Ten Thoughts piece, I was a big fan of the original release, so I was excited to see what additions could be made to the game and how they would affect the original game. Expanded releases aren’t always a good thing, of course, as adding content with no real idea of how to do so can make a good game ponderous or overblown, if not ruin the experience entirely. Even beyond that, if the content is pure fluff, it does nothing for the game but stick it back out on the market with new “content”Â that is useless. 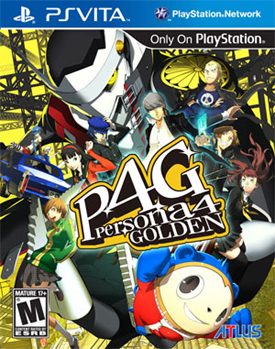 Thankfully, Persona 4 Golden avoids both of those possible problems, as the new content added to the game compliments the existing work extremely well, without overshadowing it, and the end result is a game that is a significant improvement over the original, one that’s easily worth the asking price. Note: as the game is functionally identical structurally to the original release, elements of this review will borrow from and/or condense portions of the original PS2 review of Persona 4 when discussing the repeated elements. 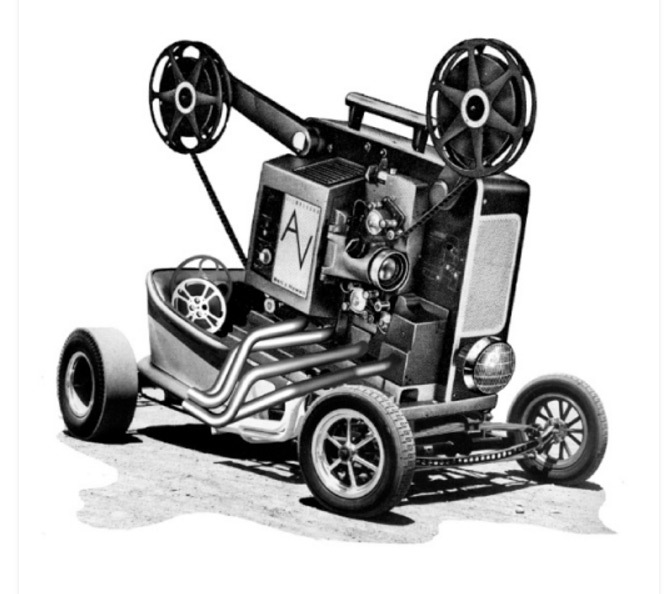 For more extensive discussions on the shared mechanics, please refer to that review for details. The plot of Persona 4 stays more or less identical this time around from its original release: there’s a string of weird serial killings going on that are being committed by a bizarre, unidentified killer, who throws his victims into an alternate dimension, where their repressed selves kill them. The police are baffled, the killer seems nigh-unstoppable, and it falls to a ragtag group of teenage kids and their talking clown bear… thing to stop the killer, as they’re the only ones with the power to do so. The plot uses a magically-charged Scooby Doo framework to build a storyline based around psychologically complex ideas, dealing with the main characters (and several secondary characters) coping with their personal flaws and growing as people, which works on multiple levels. The story is written well, the characters are rather endearing, and the whole experience generally feels, well, right from a storyline perspective. The characters are mostly easy to care about, both major and minor, and the story does some very interesting things throughout while presenting some very interesting moral questions and observations that are enjoyable and add a lot to the experience. Also, the mystery of who’s REALLY behind the murders in town is a surprising one that doesn’t really let up until nearly the end of the game, and it’s rare to see a game that features so many twists and turns come together so well and yet still remain so surprising from start to finish. Some of the same issues that affected the plot are still here, of course, such as the repetition of the Mitsuru/Fuuka plot point from Persona 3 and the non-human character discovering what it means to be human concept, again from Persona 3, but a fairly large amount of extra plot elements have been added that massively improve the plot. Small additions, such as minor scenes added between the main characters during events or introduction scenes being populated with social link characters instead of generic nobodies, help to add character to the plot. Further, several new events have been added to the game, both during the main campaign and as endgame content that flesh out the characters significantly and add a lot more to the storyline. Other characters get added chances to develop more than they had previously, which is also really helpful in establishing character motivation and feeling for them as characters, and there are also extra scenes you can potentially participate in with your significant other to give the relationship more impact. Also, the original ending has been expanded significantly to give the game an ending that fades out on more of a happy note, which is a lot more fitting to the experience and also really shows the impact the characters have and the changes they go through in the game. 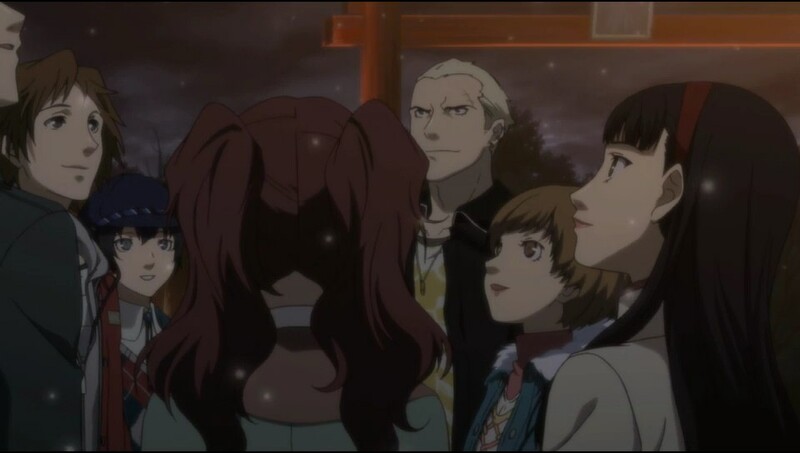 In other words, Persona 4 Golden took a plot that, while it borrowed from its predecessors, was pretty strong, and expands on it in a way that significantly elevates the source material as a result. From a visual perspective, Persona 4 Golden looks cleaner than the PS2 version, and retains the personality of the original while adding in some minor visual improvements. The character models and town environments look nice, and they have their own interesting personality that makes them special, be it the towns or the dungeons you’ll plow through across the game. The dungeons in particular are very interesting and look quite different from one another, and the hazy fog effect that permeated the television world looks just as good this time around. New costumes have been added for your party as well, which are all generally pretty interesting, especially the more absurd ones, like the Sentai Force/Power Rangers themed costumes, which come complete with their own win poses and victory cries. There are also new locations to visit and explore, which fit right into place with the existing elements and look imaginative and interesting all around. 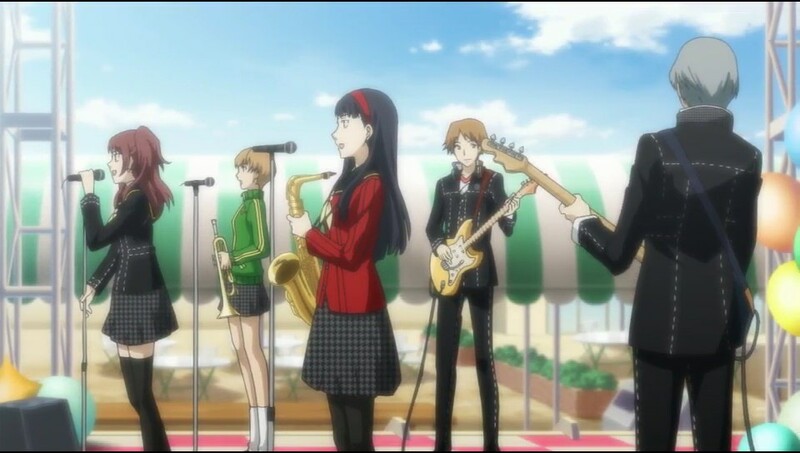 Aurally, Persona 4 is easily as awesome as ever. The game music is an eclectic mix of rock, pop and industrial tunes, with the odd tune thrown in that completely changes aural direction (say, dance techno, for instance), which not only matches the theme of the environment it’s used in, but also sells the experience more than one would think. The voice acting is also mostly top-notch, and the performances for the core cast in particular are fantastic, though the supporting cast members aren’t bad either (though Margaret still sounds incredibly bored). The new voice work is mostly fine as well; newcomer Marie is cast very convincingly and Teddie’s new voice actor is easy to accept, and while Chie’s new voice work can grate at times, after a few hours it develops its own charm. The sound effects are also fitting and work with the game nicely, as they were in the PS2 release, and the new effects and tracks that have been added to the game are also totally fitting and a pleasure to hear. For those who haven’t played either Persona 3 or Persona 4, here’s the basic breakdown: after a lengthy introduction to the game world, you’ll spend your days alternating between wandering around the town of Inaba (and, later, the nearby Okina City) and stalking through dungeons in the TV world. Combat and navigation are a breeze, as you’d expect, and combat is purely turn-based, meaning if you’ve navigated a menu in your life, you’ll have no problem navigating the combat here. Combat itself works as most RPG fans would expect: you’re given a team of allies to fight alongside against teams of monsters, and each goes in order from first to last until everyone’s gone, which starts the turns over again. All of the standard elemental concepts most games have been doing forever are here as well, as each monster and character has different degrees of ability in fire, ice, wind, lightning, light, dark, and strikes that dictate their ability to resist these attacks (or take additional damage from them as the situation dictates), as well as different stats (Strength, Magic, Endurance, Agility, and Luck) which dictate the character’s base abilities to take and give damage. Again, none of this should be surprising to fans of the genre, and most folks should grasp all of this fairly quickly. Outside of combat, you’ll also spend a decent amount of time talking to the townspeople in an attempt to glean information and make friends, or fooling around at shops to buy new gear and such. As in the original release, you can summon various Personas into battle to cast spells and perform attacks on your behalf instead of simply attacking. Your allies have a set Persona which levels up as they do, learning them new skills and adding to their stats, but as the leader, and the Fool arcana, you can summon any Persona you can acquire. The gist is as such: in the beginning, your character summons the Persona Izanagi, but as you progress, you can find more Personas after battle, which you can in turn summon in Izanagi’s stead. The upside is that you have more battle options, the downside is that your Personas level at a much slower rate than those of your allies and you can only carry so many. That’s where the Velvet Room comes in. 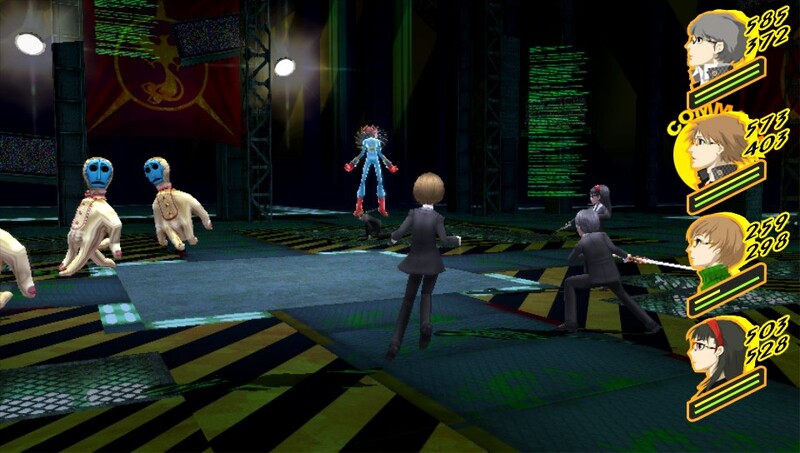 The Velvet Room is essentially a Persona science lab of sorts, as it allows you to fuse your Personas together to make brand new models as needed, which end up being more powerful than Personas randomly acquired after battle. You’ll then take these Personas into battle along with your allies and their set Personas, mostly for the purposes of kicking Shadows (the enemy forces) inside out. The dungeons themselves are navigated from a third person, behind the back perspective, so you can rotate the map around as you see fit to see your environment. As you travel through the dungeons, Shadows appear as black blobs with masks to impede you, allowing you to evade them, strike them to engage… or be struck by them to be ambushed. This progresses until you complete the dungeon and defeat the massively powerful Shadow at the end, or die trying. Outside of battle, you can make friends with various people in town and your party members, which establish Social Links that improve your ability to summon Personas and impart additional levels to them. This also improves the performance of your allies when you do so with them, learning them new skills and, ultimately, improving their Personas into better performance machines. For those who have played the original game, of course, this is an incredibly condensed version of how the game actually works; for more detail you can refer to the PS2 review linked above if you’re interested. For those who are coming in from that game and wondering what’s new, on the other hand, we’re about to get a lot more detailed, so buckle up. As noted before, there are several new plot points that come up, as a handful of special events have been added into the game before the Christmas deadline. The game has also been extended significantly, as the final day you can play is now extended to Valentines Day, which not only expands the total amount of days you have available to earn Social Links, but also adds in three new events for your party to engage in. 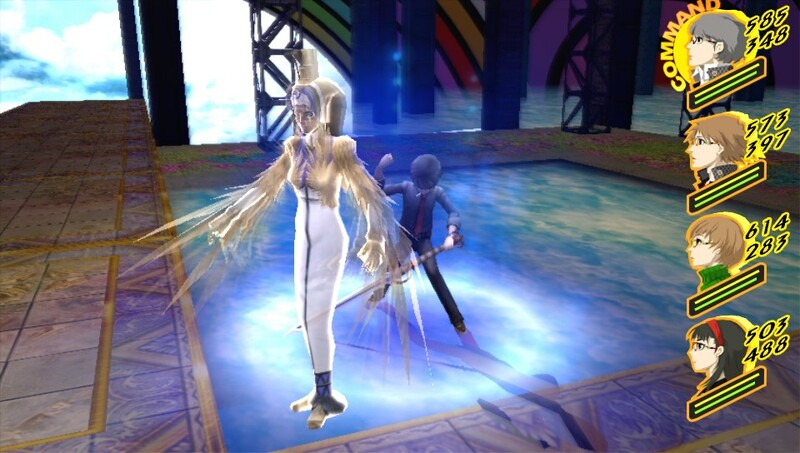 Further, two new Social Links have been added: Marie, who acts as the Aeon Arcana, and Adachi, who acts as the Jester Arcana. Marie, for those who are unaware, is the girl who has been showing up as associated with Persona 4 Golden, and her purpose here is two-fold: she adds a new mechanic to the game in Skill Cards, which we’ll discuss shortly, and she adds a new Social Link to the game to explore… well, among other things. Adachi should be no stranger to fans, as he was in the original game, but his Social Link adds some extra depth to his motivations and purpose, elevating him from his comedy sidekick role and giving him more character depth, which is very much welcome. The added plot development and character expansion is only the start of what’s new here, but it bears mentioning again: it’s fantastic that there is more character development here, as it gives the relationships more of a chance to shine and more of an opportunity to the player to see and appreciate the characters. Oh, but… one thing; if you’re the sort of player who likes to date all of the available female characters so as not to repeat the game to see every event… you’re not going to enjoy Valentine’s Day. Mechanically, the game is more or less identical to its PS2 counterpart, but several of the systems have been refined a good bit. Persona Fusion, for example, now allows you to specify what skills you’d like to carry over from the fused Personas, allowing you to easily build ultimate death tank Personas as you see fit. You can seriously slap Megidolan on every Persona you make if this amuses you (I mean, I did…) with no difficulty, which seems like it would make the game easier, but all it really does is remove the half an hour of random reselection you’d have to do to get just the right build so it’s not a problem in the least. Skill Cards also allow you to customize Personas a bit by simply providing you with skills that can be used on a Persona, learning the Persona that skill instantly. You can get Skill Cards in the dungeon as you go, or by stopping into the coffee shop in Okina City, which will nab a skill from an equipped Persona and transfer it to a skill card for you. You can then turn over the Skill Cards to Marie in the Velvet Room, allowing her the ability to copy that skill (but losing the original card) so you can buy and use Skills on Personas as you see fit. As such, you can easily build your Personas in whatever way you want, so yes, if you want a Helel who’s immune to every element, except Almighty, the ability to do so is easily within your reach. Beyond that, Shuffle Time has also seen an overhaul. In the original game, cards appeared randomly at the end of battles and spun around, and you would pick one (if you wanted) that would reward or punish you in some way. This time around, cards are simply dropped to the bottom of the screen and you can select one to earn the benefits associated. The cards are similar to those in Persona 3, meaning that you’ll see the Sword (Skill Card), Wand (bonus EXP), Cups (health and SP recharge) and Coin (bonus money) cards from that game, as well as various Arcana cards that can help or hurt you, and Personas to add to your roster. For those wondering “Why would I choose a card that hurts me?”Â well, these cards add additional draws you can use to get more cards. You could, for example, pull a card that halves your EXP but gives you two more draws, which can allow you to pull stat bonuses for your Persona, extra money, or anything else you might want from the pile. Further, if you can manage to draw all the cards from the pull, you get a bonus; at the end of the next random battle Shuffle Time immediately pops up, and you instantly get three draws to start. You can easily build a whole string of Shuffle Times from good draws and random chance, if you’re willing to make a few sacrifices, and the benefits can often be worth the risk. 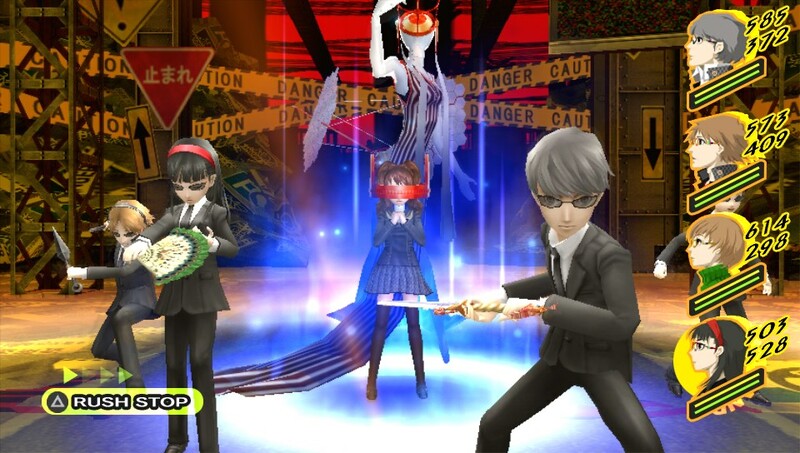 Your allies have also been considerably rebalanced for Persona 4 Golden, to a point where they can be used in entirely different ways depending on how you want to tune them. To start, as you level up your Social Links, your allies not only learn the ability to save you from attacks and perform follow-up attacks, but also learn skills for their Personas outside of normal leveling. Additionally, everyone has been given all new skills they never had, so, for example, Yukiko can learn Mudo-based instant death attacks, Naoto comes equipped with normal elemental spells, and (in the statement that is going to instantly make a lot of people happy) Kanji can learn Power Charge. As such, your party members are instantly broadened in functionality and can be used in a lot more situations than before. Rise can also learn new skills, so as not to leave her out in the cold; she can now randomly cheer on your party during All Out Attacks for added damage, heal or boost the party, or remove status ailments, plus she can instantly scan enemies to know all their weaknesses late in the game, making her a powerful ally if you max her out. But wait, there’s more! 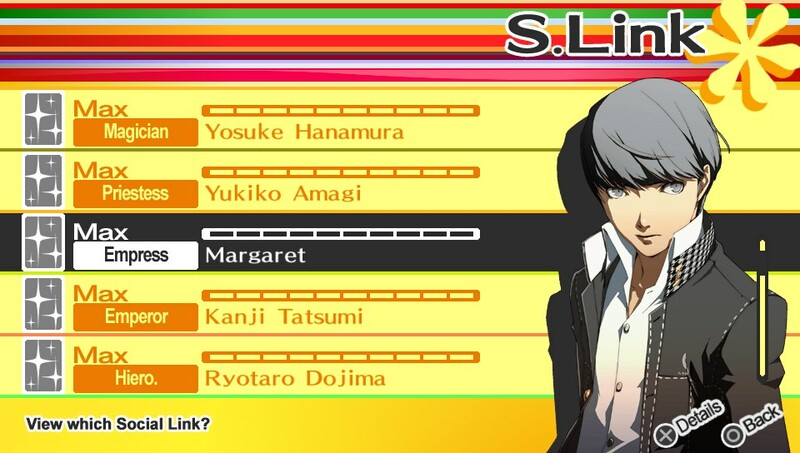 If you manage to max out their Social Links before the end of the game, this develops their Personas to a second tier Persona, which fans will know… but if you then speak with them again after they come to you, their Personas will develop a third time, which learns them a new skill on top of that. Some of these skills are… sub-optimal, but many are amazingly useful (Chie learns a skill that ups everyone’s stats across the board for example), which further expands the usefulness of your party. These two elements, on their own, are pretty fantastic, but that’s not even the end of how much more you can do with your party members. 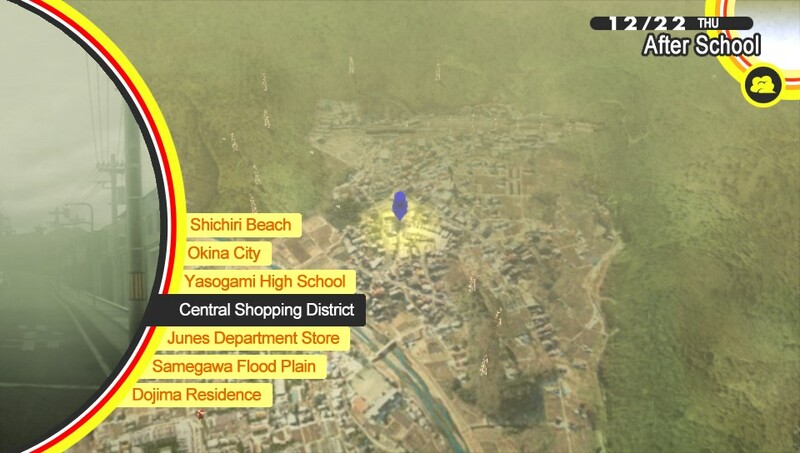 Persona 4 Golden has added in two new elements that don’t seem to add much at first: the ability to ride a scooter, which allows you to visit Okina City and the beach, and the ability to walk around town at night, which lets you visit an extra shop and goof off in town. These elements also allow you more time to spend with your allies and Social Links in general, however. When you go to the Central Shopping District, you’ll occasionally see someone standing near their bike by the gas station… or, in Teddie’s case, him standing there like a derp. Talking to the person allows you to invite them to go to the beach or the hot spring (which is kind of weird but stick with me) to talk about life. This is actually something of a gimmick that allows you to talk about the past, which can allow your ally to recall a skill you’ve deleted from their Persona, or the future, which can allow them to learn a random new skill that might be very useful… or completely useless. It’s a crap shoot, but still welcome. Further, you can see your friends standing around the Shopping District at night and goof off with them if you want; this can’t advance the Social Link, mind you, but it does add to it if they’re not ready to advance yet, and nets you a useful item for your troubles, which gives you more to do at night aside from studying and such. You can also invite your friends to the movies in Okina City, which adds stats to their Personas and can give them an instant level up, if they enjoyed the movie, and since they’ll occasionally text you to say “HEY LET’S GO TO THIS MOVIE”Â you’ll have a good idea of who will like what in advance. Finally, some pairs of characters (Chie/Yukiko, Naoto/Kanji and Teddie/Yosuke) will occasionally engage in tag team attacks after a successful All Out Attack, which not only looks really cool, but does a ton of extra damage, which can be a big help, though this, too, is random as to whether it goes off or not. BUT OH YES, THERE’S MORE! You can also plant plants in a garden next to your house that, when gathered, can be used as consumable items to restore SP, crack open locked chests, reflect attacks and more, depending on what you grow, and since this takes no time you can feel free to do it as needed. There’s also a bug catching minigame added that allows you to collect bugs, as certain bugs are needed to catch specific kinds of fish, and while you don’t HAVE to participate in this, it’s cute… and, oh yes, makes the Hermit Arcana slightly more challenging to max out. Leveling your stats has also been improved a bit, as you can now buy books that improve your ability to gain statistics from eating at the Chinese restaurant, improve your ability to read (thus burning through two chapters instead of one per session), improve your gains from part time jobs and studying and more, so you can easily max out your skills much faster this way. The shrine also has added a fortune box on non-rainy days that you can donate to as a way to improve a relationship with a character, guaranteed; it won’t boost the same amount it would if you spent time with the person, but you can do this at night, which is helpful for Social Links you can’t spend a lot of time with normally. There are other minor changes, such as the Reaper showing up during a first playthrough, a complete retuning of questions during school, and the ability to skip scenes by pressing Start if you’ve seen them already that make things more interesting and user friendly, as well, so you can expect to see something new nearly every time you boot up the game. BUT WAIT, THERE’S MORE! The game also offers something called “TV Overlay”Â which you can bring up by tapping the screen (or from the main menu to get to the TV Listings), which allows you to view various television channels, which are really just extra content. The extra content is fairly robust, however. You can view the various channels you could normally see from here to check the weather and such, but you can also watch live performances of the songs from Persona 3 and Persona 4, view any animated cutscenes you’ve already seen at any time, view various thematic explanations and psychological concept discussions led by Professor Edogawa, see artwork from the development, and view trailers for the game and other Persona products. 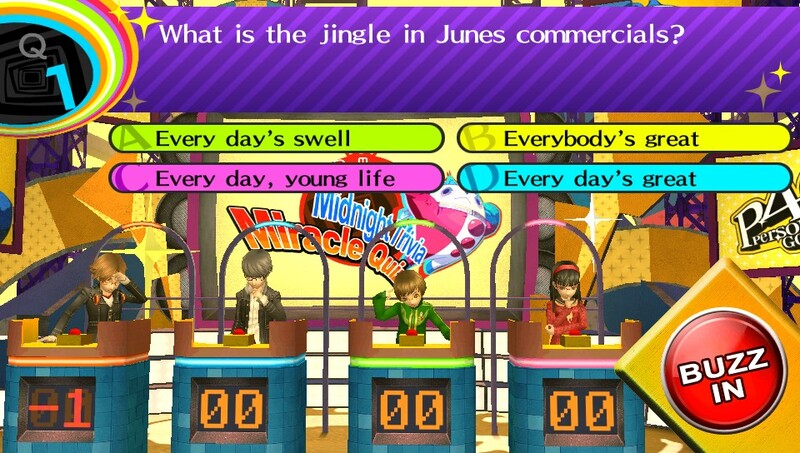 There’s also a jukebox here that allows you to listen to music you hear in the game at any time, and best of all, a cute quiz show minigame featuring Teddie, Chie, Yukiko and Yosuke (and you, of course) that’s fun and honestly hilarious to play. This is the sort of content that developers almost never think to add to games, and it’s fantastic that so much of it was added to this release because it’s all very much welcome. The main game is easily a hundred hours long or so, though depending on how much you fast forward through that you’ve seen already it can be less (I completed it in sixty and that’s including fast forwarding through redundant dialogue so, yeah, there’s a lot of new content). There are also now somewhere around six possible endings to unlock based on choices made through the game, so if you want them all you’ll have a little work ahead of you (though technically you really only need two of them). Of course, that’s not even close to all you can do; you can also play through the standard New Game Plus, which allows you to carry over your Persona Compendium (where your Persona are registered when you create and improve them), personal skills, and money, among other things, into a new game to see events you couldn’t see the first time. Aside from allowing you to fuse new Personas and fight some hidden foes, this also allows you to play through several new conversation paths with your Social Links and answer questions you lacked the personal skills to answer the first time around. 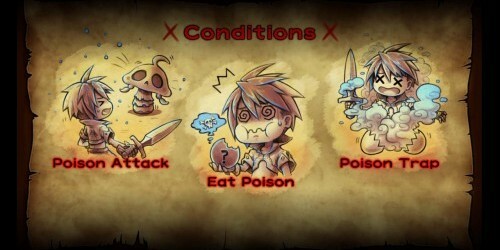 Aside from that, the game also features enemies who only appear on rainy days, items that can be sold to the town blacksmith to make new and unique items, a hidden boss to fight and more. Plus there are now FIVE difficulty levels to play on, including a difficulty that is absolutely brutal and a difficulty level so easy that if you fail at it you’re… just doing something wrong. In short: this is the most robust Persona title ever, and at the price there’s no reason not to own it. Now, as I’ve said before when discussing the games, yes, Persona 4 on its own is basically a yellow coat of paint and some house repair on the old frame of Persona 3. Many of the mechanics are retuned from that game, and this is a rerelease of a four year old game, so in that regard, that’s a negative. Also, the game still misses the opportunities it had to better integrate cohesion with other games in the Persona series, as no additional cameos are added from the prior games, which could have been done easily enough. It’s also disappointing that we couldn’t see a female protagonist option, similar to what Persona 3 Portable added, given that it wouldn’t have required as much effort as it did in that game to integrate since your entire party is cast of Social Links and all. That said, though? Outside of some reused assets from Persona 3 that were here four years ago? I have honestly nothing bad to say about the game. I don’t. The game holds up very well when compared to its four year old counterpart, and such an insane amount of content has been stuffed into the game as to make it completely worth the rerelease. This is the game Persona 3 FES should have been; a release that expands logically on the existing content without sticking in content that feels tacked on or bland, making a rerelease that compliments the original but adds so much to it that it more than justifies the release. It’s mechanically sound, well translated to its new home console, and well designed across the board, and the only depressing thing about it is that it came out on a console that no one really owns yet, because it deserves a larger audience than it can get on the Vita. So, to sum up, Persona 4 Golden is basically almost the best possible rerelease of a game that was great to begin with, and unless you are staunchly opposed to buying the game on principle for some reason, you’d be a fool not to buy it. The core game holds up as well as it ever did, the storyline is as strong as ever, the game looks and sounds excellent on the Vita, and the mechanics have translated well to the Vita with no technical issues or hiccups. Further, a substantial amount of content has been added to the game, between several hours of added storyline content, new Social Links, expanded development options for your party members, expanded gameplay mechanics in and out of battle, expanded Persona development and all sorts of novel extras above and beyond the main game. With half the content added to the already robust game this would be a strong port; with the full amount it’s easily the definitive version of the game in all respects. True, it’s still basically similar to the last few Persona titles that have been released, more could have been done to add in a female protagonist option here, and not a lot was done to integrate the game into the universe between the other titles. Honestly, though, these are minor complaints in comparison to the sheer amount of positive that can be said about the game. Persona 4 Golden is basically a game that anyone can and should own unless you have a specific reason to avoid doing so, as it’s the best version of the game available, one of the best games in the Shin Megami Tensei series at this point, and one of the best and most worthwhile remakes ever produced. You don’t get much better than that. Persona 4 Golden is the sort of remake/rerelease all developers should aspire to create, as the game is an exceptional product that justifies its existence by sheer force of will that fans and newcomers alike will find plenty of reasons to love. The main game has been translated to the Playstation Vita fully intact, as the main storyline is as solid as ever, the visuals and audio look and sound fantastic on the machine, and the gameplay is as functional as it ever was. 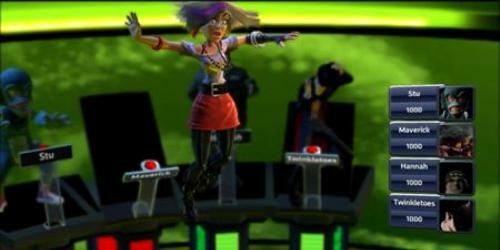 The game is also stuffed full of new content, however, including several hours of added story and gameplay content, new Social Links, new options to tune and develop your party members and Personas, all kinds of expanded gameplay mechanics and a plethora of content to play with outside of the main game. The amount of additions made to the game is simply staggering, to the extent that you’ll find new things to see practically every time you boot up the game, and there are a substantial amount of things to keep you coming back long after you’ve beaten the game. The game is still essentially similar in many respects to the various iterations of Persona 3 that exist on the market, lacks the female protagonist option found in Persona 3 Portable that would have been potentially viable here, and still doesn’t do much to make use of its shared universe, but these are very minor complaints to lay at this game’s feet. 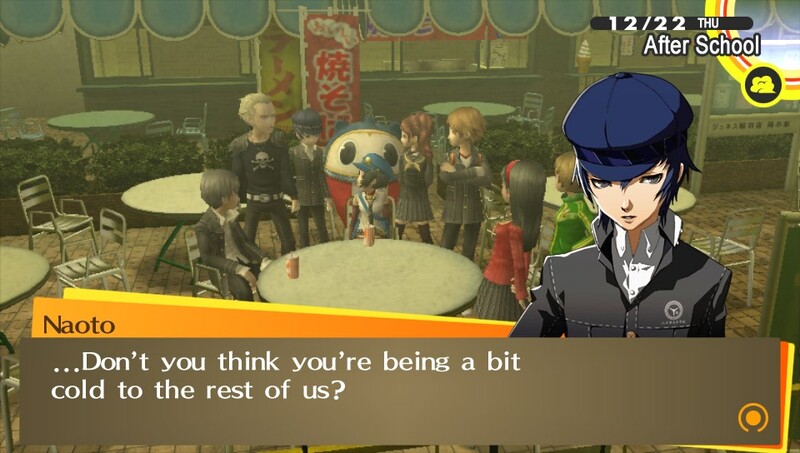 The negative, such as it is, is drowned out against the sheer volume of positive additions attached to a game that was already solid to begin with, and the end result is that Persona 4 Golden is a game that is very easy to recommend and even easier to love. Wow. Ok, adding this to my collection of PS Vita games as soon as I can then. Yeah, I would. It’s really good. I don’t know if this game warrants a PS Vita all on its own. Sounds like a fantastic redux and I loved the original on PS2. 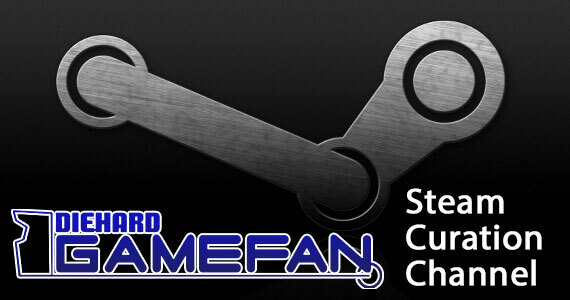 Have you heard if this version will be released on PS3 at a later time? I can’t say it’s a system-selling game, no, though the console is starting to grow legs so maybe in a year that’ll change. I haven’t heard anything about the game being ported to the PS3, though that honestly wouldn’t be hard, given that the game only uses the touch screen to an extremely minor level and the touch-screen commands that do exist could easily be mapped to, say, the rear triggers on the PS3 controller. Given that the game seems to have actively driven Vita sales upwards in Japan, though, Atlus may just leave it on the Vita.